As we age, we start loosing endurance and stamina. This is a natural process that happens because of decline in our aerobic capabilities and muscle strength. But this condition is not irreversible. Cardio exercises are an effective way to improve endurance and stamina. They benefit both healthy older adults and older adults with already existing medical conditions like hypertension, diabetes, etc. Moreover, they also help in controlling blood pressure, boosting energy, and strengthening the bones. Many people are under the confusion that whether they should exercise? Let me tell you there is no such thing as being “too old” to exercise. According to the Centers for Disease Control and Prevention (CDC): Cardio or aerobic exercises refer to any action or workout activities that increase your respiratory and heart rate above your normal resting rate, sustained for at least 10 minutes. 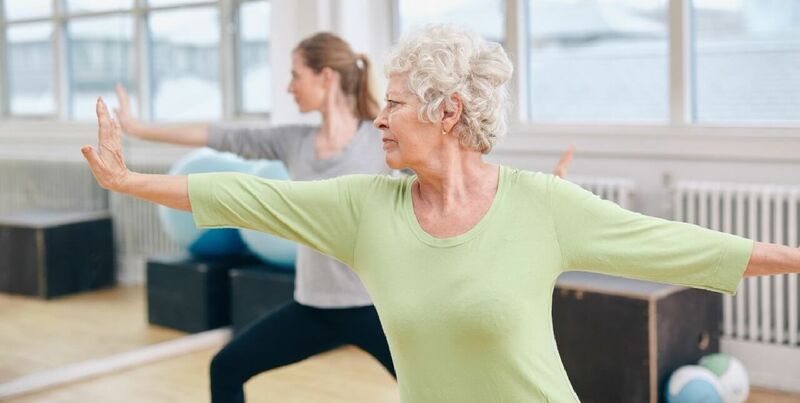 As a thumb rule, healthy adults of more than 65 years age should try to do at least 150 minutes of moderate-intensity cardio exercise each week. Moderate-intensity activity enhances your heart and breathing rate up to a level at which, though you can still speak, you would not be able to sing. How Much Cardio Is Enough, And Not Too Much? Three factors are mainly related in deciding how much cardio exercise is enough to develop and keep up strong heart and lungs – without getting into catabolic mode (the breakdown or loss of muscle and other bodily tissues). (i) Frequency: Three cardio workouts in a week are ok for overall fitness. Less than that generally are not enough to keep you up fit, and more than that may cause catabolism. (ii) Duration: To make your cardio effective, it can be as short as 20 minutes and as long as one hour. Some experts advocate that shorter but more intense workouts, for example interval training, are more effective for fat burning and conditioning than slow long distance (aerobics). (iii) Intensity: There is no perfect way to determine intensity in cardio workouts. But, there are some good thumb rules. One such yardstick is the “Talk Test” while you are jogging, running or doing some other kind of cardiovascular exercise. Low-intensity exercises only slightly increase your heart and breathing rate. They are suitable for older adults with various medical conditions that affect their ability to exert themselves. The most standard low-intensity cardio activity is walking. A stroll down the sidewalk, around the block, or even walking down a grocery aisle when shopping all counts towards your weekly 150 minutes. If your health and stamina permit or improve, you might consider increasing the pace or length of your walks. Tip: While walking, make sure you use a flat, level surface and wear comfortable shoes. Begin with a slow pace, but try to increase, as you get more confident. Recreational swimming is another low-intensity activity that offers good cardio benefits. Moreover, it has an added benefit that being in water helps ease and reduce joint strain and pressure. Low-impact water aerobics classes may also be available at a local facility like a gym or community centers. Some gyms may also have recreational swimming classes tailored particularly for older adults. More moderate-intensity exercises are normally suitable for healthy older adults. They raise your heart and breathing rates more than those discussed above. Because of this reason, they are not recommended for all seniors. The thumb rule for ascertaining if something is of moderate-intensity is that you can talk clearly, but not sing. Cycling is a common moderate-impact exercise, though road biking can have risks particularly if you struggle with balance. A good option is a recumbent stationary bike, which reduces your injury risk. If you enjoy the pool, try swimming laps. It’s more vigorous than recreational swimming, but remains moderately gentle on joints. If you have grown comfortable with walking and wish to try something more, consider hiking. It’s a more strenuous option than walking. A sloped and uneven surface of hiking trails will produce a stronger workout than a stroll down the street. Dancing is also a good option. You can find some senior centers and gyms, which offer group-dance lessons especially for seniors. You can choose swing, jazz or ballroom options according to your personal choice. Tip: We recommend a proper warm-up followed by light jogging and then five-minute stretches. For the sake of variation you can do biking, though a stationary bike is advisable if you find you have difficulty in balancing. For those who are more of social type, dance is an effective option. They can join a dance class at a gym, community, or senior center and enjoy some jazz, ballroom, and much more. Like swimming, you can also find dance classes particularly tailored for seniors. High-intensity, or vigorous, cardio exercise push your heart and breathing to the point where talking can become difficult. One minute of high intensity exercises is the equivalent of two minutes of moderate intensity exercise. Thus, you only need 75 minutes per week to meet the CDC recommendations. However, high-intensity cardio activities place extra stress on joints and can cause injuries. Make sure to consult your doctor before taking up this level of activity. Longer or faster jogs and biking uphill are examples of high-intensity exercises that will make your heart and lungs to work. Other examples are shoveling snow or raking large amounts of leaves. However, you need to be careful. Take care to wear clothes according to the weather and not to overdo it. Cross-country skiing, rowing, or working on exercise machines that mimic the motions of the activities, will also increase the potency of your workout. Tip: If you want to include an activity such as jogging, try an elliptical machine. It tends to reduce the impact on your ankles and knees.